Written by (a modern day) Sarah Maddock. This year marks the 125th anniversary of the first woman – Sarah Maddock – to cycle from Sydney to Melbourne. Sarah was 34 and she had only taken up riding the previous year. 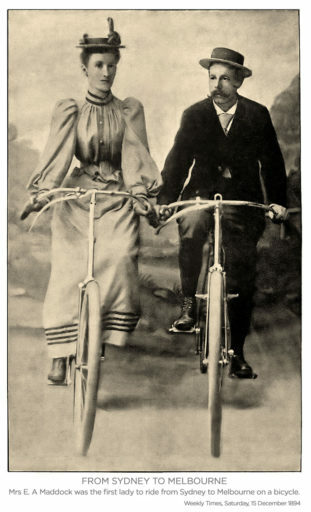 With the introduction of the new safety bike design (both wheels being the same size, unlike the penny farthing) many more people took to cycling, including women, as Australia got caught up in the cycling craze of the 1880s and 1890s. The ride was prompted by her husband – Ernest, who had been told by his doctor to make a “complete change” in order to improve his ill health. However, all eyes were on Sarah throughout the ride as she was set to become the first woman to complete this feat. They departed Sydney on Wednesday 19 September 1894, and followed the great south road (which is the Hume Highway today) passing through many New South Wales and Victorian towns including Marulan, Goulburn, Yass, Gundagai, Holbrook, Albury, Euroa and Kilmore to name a few. They averaged approximately 100km a day and arrived in Coburg 10 days later, where they were escorted into Melbourne alongside members of the Coburg cycling club. They travelled light, carrying a change of clothes on the handlebars of their New Rapid and Conqueror bikes. Sarah and Ernest faced a strong headwind throughout the journey and rode over mountains, through swamps and over sandy plains. They tackled corduroy tracks, ploughed lands and carried their bikes over flooded creeks. Despite all of this neither of them got a single puncture! In Marulan they had trouble getting a place to stay as they were mistaken as circus performers, who had a reputation for not paying the bill. While later on in the trip another proprietor gave them a discount on their bill, taking pity on them as she thought they were riding to Melbourne to save money on their honeymoon. In those pre-federation days they had to arrange an exemption so they weren’t charged a hefty tax by the customs officer at the border of NSW and Victoria to bring their bikes across. Prior to arriving in Melbourne, Sarah was chased by a bull for at least 5 furlongs (1km) before outpacing it just near Kilmore. At the end of the ride, Sarah was made an honorary member of the Melbourne Cycling Club (as a female couldn’t be granted membership). Sarah Maddock went on to play a key role in encouraging women to take up cycling. 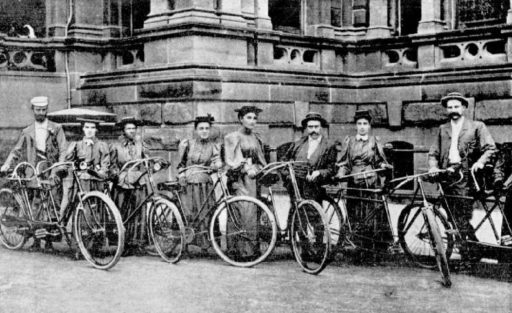 Her ride prompted Melbourne women to form their own cycling club and in Sydney she formed the Sydney Ladies Bicycle Club (the first cycling club for women) and following this, the Stanmore Wheelers. She also wrote a regular ladies column in the Cycling Gazette providing advice to riders on everything from maintenance, fitness and what to wear. In the early 2000’s, while living in Sydney, I Googled my name, Sarah Maddock, and came across my namesake. This discovery has led me down a path of exploration – researching as much as I could about Sarah’s life and tracking down her great grandchildren. The 19th century Sarah has had a great impact on my life. Her adventures by bike and her advocacy for women in cycling has inspired me to take up the challenge to undertake my own modern day version of the Sydney to Melbourne bike ride. I was originally planning on doing the ride in 2018 but suffered an injury that caused me to postpone it. Since then I have partnered with Mulga Bicycle Tours to design a fully supported cycling tour that will enable others to take part and celebrate the 125th anniversary. The tour will start on Wednesday 28th August and will take 14 days including 2 rest days, providing an opportunity to explore the area. Daily distances will range between 65 and 127km per day, with the option of taking a break in the support vehicle at any time. It will be a modern day version of 19th Century Sarah’s achievement, as cycling the Hume Highway would be more gruelling than enjoyable.  Instead, the tour will take in some new towns such as Cootamundra and Wagga Wagga and in Victoria we will explore both the Murray to Mountains and Great Victorian rail trails, which will give a sense of what the scenery and ambience would have been like for Sarah and Ernest. While the route may be slightly different, the essence of celebrating the adventurous spirit of Sarah is at the heart of the tour by encouraging others to take their own modern day adventure! For more details, have a chat with the team at Mulga Bicycle Tours who are a Ride High Country Preferred tour operator.